On Tuesday, the Bill on Amendments to the Tobacco Act (118 SE), initiated by the Government, passed the first reading in the Riigikogu. It tightens the requirements for the packaging and labelling of tobacco products, and picture warnings will be shown on the packaging. The Minister of Health and Labour Jevgeni Ossinovski said that smoking is connected with a major health risk and causes economic damage to the state. “8.3 per cent of the life years lost due to illness and of premature deaths of the Estonian population are due to the smoking of tobacco. This means an estimated 4000 deaths per year. According to a study conducted in 2004, the smoking-related loss of health of the Estonian population totalled 28,000 life years that year,” Ossinovski said. He added that, according to an analysis made, the direct economic damage caused to the state due to smoking amounts to at least 65 million euro per year. The Bill will harmonise the requirements for the packaging and labelling of tobacco products and tobacco-related products in EU Member States. Sales packages of cigarettes and smoking tobacco will have to be labelled with new picture and text warnings as of 20 May 2016. The Bill will prohibit open smoking areas in buildings as of 1 June 2017. The Bill will prohibit the use of vitamins, caffeine or taurine or other stimulant compounds as additives in tobacco products. Also, additives having colouring properties for the tobacco smoke or facilitating nicotine uptake may not be used in the future. Filters, papers, packages or capsules of tobacco products may not contain flavourings, tobacco or nicotine in the future. 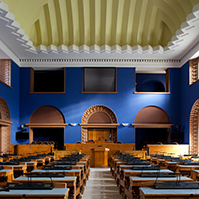 The Riigikogu approved with 70 votes in favour (4 abstentions) the Resolution of the Riigikogu “Appointment of a Member of the Estonian Public Broadcasting Council from among Members of the Riigikogu” (150 OE), initiated by the Cultural Affairs Committee. In connection with the termination of the mandate of Priit Toobal as a member of the Riigikogu before the end of its term due to resignation from the Riigikogu of his own accord, member of the Riigikogu Enn Eesmaa is appointed as a new member of the Estonian Public Broadcasting Council. 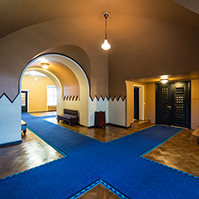 As of 26 May 2015, members of the Riigikogu Krista Aru, Martin Helme, Kalle Muuli, Heidy Purga and Mihkel Raud also belong to the Estonian Public Broadcasting Council. In addition, Mart Luik, Rain Tamm, Agu Uudelepp and Pille Pruulmann-Vengerfeldt belong to the Council as acknowledged experts in this field of activity. The Bill on Amendments to the Packaging Act (125 SE), initiated by the Government. The Bill will mitigate undertakings’ obligations regarding the audit of the data to be submitted to the packaging register. Packaging undertakings who place on the market less than five tonnes of packaging per year will be exempt from it. According to statistics, there are circa 2000 such small undertakings in Estonia. The share of the quantity of packaging placed on the market by these undertakings in Estonia is below two per cent. The Bill on Amendments to the Accounting Act and Amendments to Other Associated Acts (65 SE), initiated by the Government. The Bill updates the legal framework of accountancy and brings it into conformity with European Union law. As major issues, the Bill discusses simplification of the annual report of micro and small undertakings, and the criteria for defining micro and small undertakings and medium-sized and large undertakings. Under the Bill, micro undertaking is a company registered in Estonia whose assets total up to 175,000 euro, whose obligations do not exceed capital and reserves, who is not liable to account for value added tax and has one shareholder who is also a member of the management board. 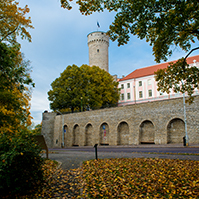 Small undertaking is a company registered in Estonia in whose annual accounts only one indicator may exceed the following conditions on the balance sheet date of the financial year: assets total 4 million euro, sales revenue 8 million euro and average number of employees during the financial year 50 persons. 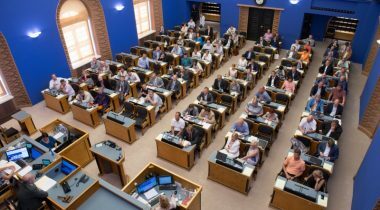 Member of the Riigikogu Maris Lauri said that 12 motions to amend the Bill had been submitted, most of which will make the text of the Bill better legible and the regulation more understandable to the target groups. With the motions to amend pertaining to the content, the definition of micro-undertaking is changed, and it is specified in which cases the entity included in the consolidation will not have to be recognised in detail in the report of the consolidation group. Also, under a motion to amend, the entry into force of the Bill will be postponed to 1 January 2016, and other deadlines for entry into force will be changed in order to allow time for the Accounting Standards Board and the Centre of Registers and Information Systems to make necessary changes. 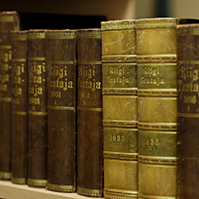 The Draft Resolution of the Riigikogu “Making a Proposal to the Government of the Republic” (102 OE), initiated by the Estonian Centre Party Faction, which provided for making a proposal to the Government to draw up a Bill that would prohibit the sale of energy drinks to young people under 16. Märt Sults who took the floor during the debate supported the draft Resolution. The result of voting: 30 in favour, 6 against. 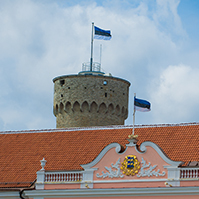 The draft Resolution was not supported as a majority vote of the members of the Riigikogu was needed for the Resolution to be passed. Under the Bill on Amendments to the Private Schools Act (142 SE), initiated by the Government, the covering of the operating expenses, that is, the costs related to the maintenance of the school building, of private general education schools will become voluntary for local governments. When the Act enters into force, the city or the rural municipality will have the possibility to support private schools if the local government finds that the school is needed by the community. Private schools where children with special educational needs study are discussed as an exception in the Bill. The proposal is to support these schools to a considerably larger extent and over a longer period of time. The Bill does not concern education support that state schools, local government schools and private schools receive on the same bases. The deadline for entry into force of the Act is 1 January 2017. In its judgment of 28 October 2014, the Supreme Court declared it to be in conflict with the Constitution that the state has given local governments the national task to finance private schools on the basis of § 22² of the Private Schools Act but has not provided funds from the state budget therefor. The Minister of Education and Research Jürgen Ligi said that the judgment of the Supreme Court is the basis for the legislative amendment. Ligi explained that the Constitution imposes on the state and the local government the obligation to ensure a situation where every child of compulsory school age can fulfil the obligation to attend school and acquire education free of charge. Ligi said that the content of education is determined by the state and these costs are principally covered by the education support accompanying the student. However, the local government has to ensure optimal school network and it is therefore responsible for the management of the operating expenses. “Other educational institutions, including private schools, can also be opened and managed under the law, but state participation in the covering of the operating expenses of such schools is not a constitutional obligation. The Chancellor of Justice, the Auditor General and the Supreme Court have confirmed that,” Ligi said. He added that the state has the obligation to accept the freedom of the owner of the private school to found a private school but it has no obligation to subsidise private schools. Märt Sults, Mihkel Raud, Priit Sibul and Laine Randjärv took the floor on behalf of factions during the debate. 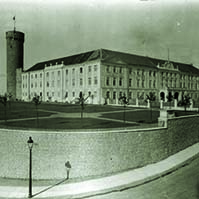 Märt Sults on behalf of the Estonian Centre Party Faction moved to reject the Bill at the first reading. Mihkel Raud and Laine Randjärv supported the passing of the Bill. Priit Sibul called not to hurry with the Bill and to find the best solution for the society. The first reading of the Bill was adjourned due to the end of the sitting and it will be resumed tomorrow.